Beyond Meat is a company that makes alternatives for non meat eaters. 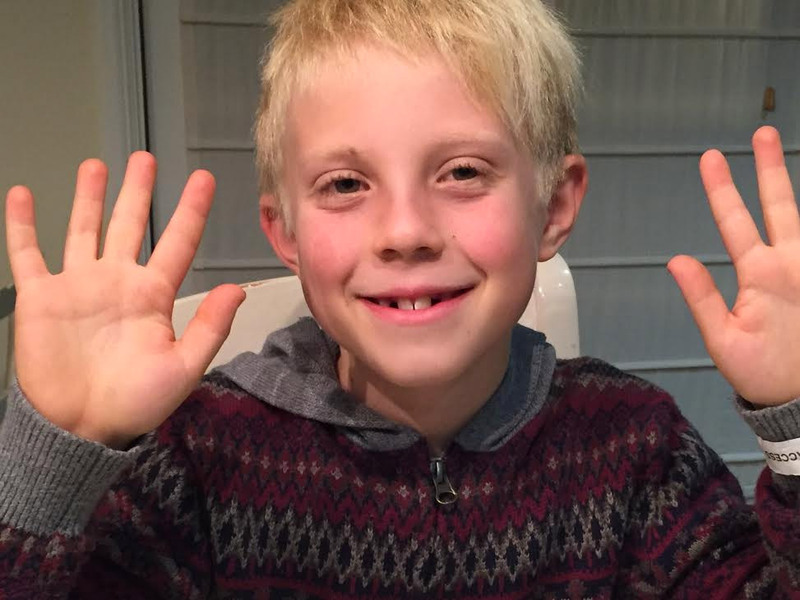 I think that it is great these days that there are so many alternatives for people who don’t eat meat because it is a really fast growing trend in America behind surfing the web (obviously!). 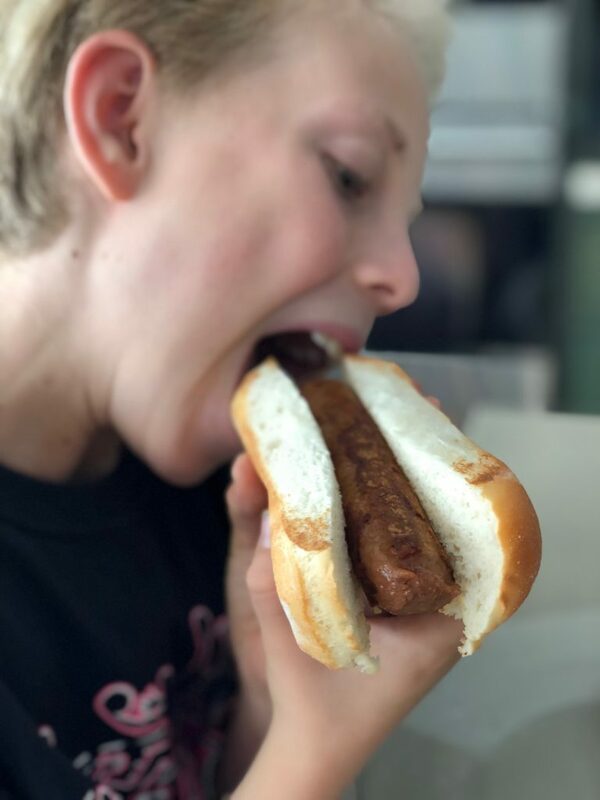 Tom Brady is a big investor in Beyond Meat, and today I am going to review and tell you about their vegetarian/vegan and gluten free sausages. The Beyond Meat company also makes plant based burgers and other non meat products like “beef” crumbles and I really like them all. 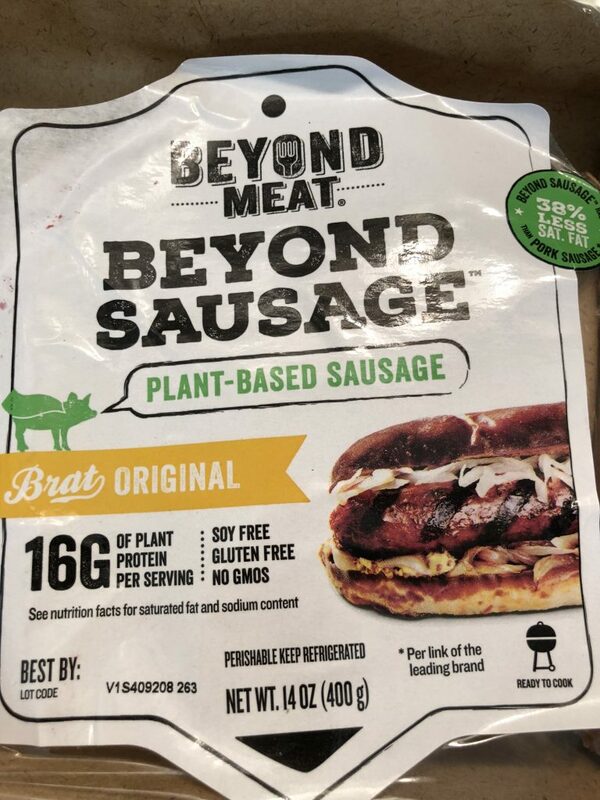 But I am starting today with these Beyond Meat Beyond Sausages because I honestly can’t get enough of these and I’m pretty sure you won’t be able to either. But I also have to go back to Tom Brady for a minute. Mentioning him gets my sports brain thinking. I wrote this post right in the middle of the world series but then I had to just let it sit for a week because I had so much energy go out of me. The day I had these sausages actually, I had two sports games. One to play and one to watch. 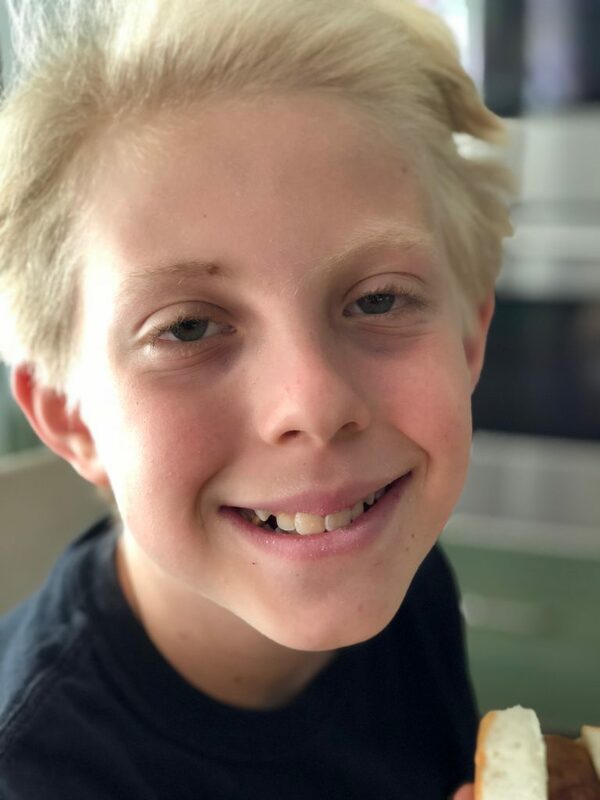 One was my basketball game in which we lost by a lot because the refs made super bad calls and called offensive fouls on us when there should have been defensive fouls on the other team! My coach thought so too. But of course these are volunteers so we just go with it and keep trying. We ended up losing by twelve points but it really felt like a lot more points than that. Then, I went to Game 4 of the World Series and it was fun to go to but the Dodgers lost by a final score of nine to six. Sometimes when I’m down about sports I bring myself back up by thinking about good food. So even though it was rough to see my team defeated in the Series there is always next year. 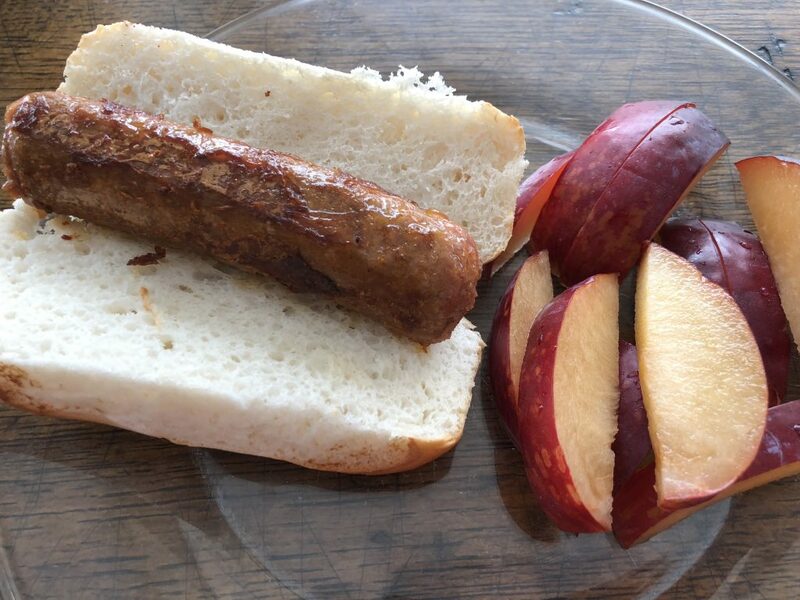 And for now…there is always Beyond Meat sausages to fill up my stomach in a happy way. So, back to the sausages! I absolutely love them! 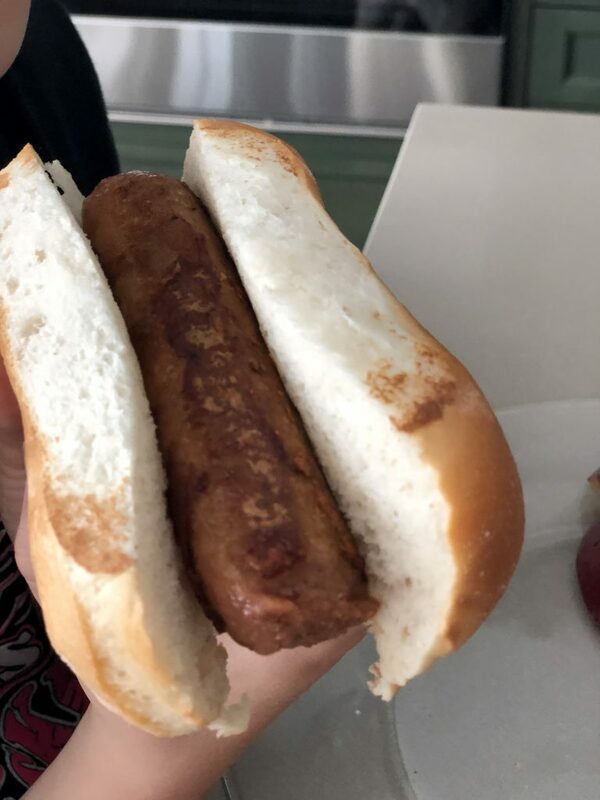 When you think of the Beyond Meat sausages, you don’t think breakfast, you think lunch believe it or not. About 4 inches in length, the sausage creates a sausage flavor for your mouth along with a little hint kick of salt at the end. It is a delicious piece of food and even if you are not vegetarian, I recommend that you try it. What is interesting about this sausage is it is much more filling than other sausages and quite big in size over any other sausages. You can access the Beyond Meat sausage from the frozen section at Whole Foods and other stores like Sprouts. So before I say that I recommend that you try this and all that stuff, yum! I can tell that your mouth is watering while you are reading this and probably either putting your shoes on or starting your car up to go to Whole Foods. If you haven’t started-start! And, of course, I recommend that you try this brand. By the time you get back from the store I’ll probably be digging into another one of these! When I read, “I can tell that your mouth is watering while you are reading this…” I looked around the room for hidden cameras! Yes, the descriptions and photos and your enthusiasm made my mouth water! However…it’s snowing here and even though Whole Foods is just 3 blocks away, I’ll wait until tomorrow to satisfy my longing for Big Meat sausage! Thanks for the recommendation!! I eat these every week now Pam. If you haven’t tried them you should because they are really good and becoming really popular now.